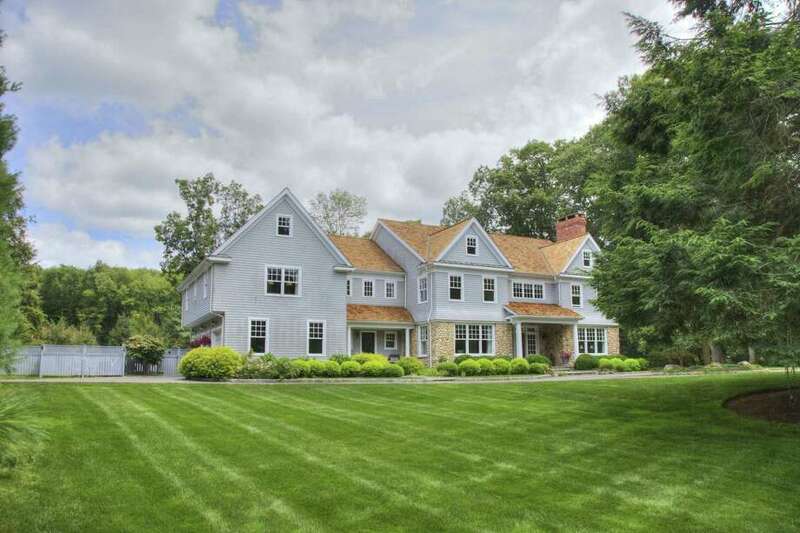 The custom-built colonial house at 2 Connors Lane in lower Weston sits in a very private setting of 2.33 level acres convenient to the centers of Weston and Westport. WESTON — The designer of the custom-built pale gray colonial house at 2 Connors Lane in lower Weston must have anticipated the changing tastes and needs of the modern day family when drawing up the blueprints for this house. The 13-room house was built in 2005 with many of the identifying features of a classic colonial - a rectangular structure with a center hall entrance, balanced window placement, and pitched roof. Inside, it has exquisite millwork and moldings, visually appealing architectural details, high end finishes, and hardwood floors throughout most of the house. There any similarity to a traditional colonial residence ends. This house was clearly designed and built for modern day living and entertaining with its 7,595 square feet of living space and open floor plan, which is so valued by today’s homebuyers. Relaxing and entertaining on this property is enhanced by its amenities in the backyard including a heated Gunite in-ground swimming pool, bluestone patio, and fire pit, and by its seamless flow between the indoor and outdoor living spaces. The yard is professionally landscaped with many perennial plantings. The house is well positioned on a beautiful property in a serene setting at the end of a private cul-de-sac. The privacy and beauty of this 2.33-acre level property is protected by a scrim of tall trees, and there are no unsightly utility wires or poles to obstruct the view. The utilities for this property are underground. Although it seems remote, this property is actually convenient to all local amenities including schools and the Westport train station. As one travels down Connors Lane they should take note of the pillars that mark the entrance to the property. Rather than fieldstone these pillars are made of local river rock, which figures prominently in this house. River rock serves as an attractive unifying factor in the overall design beginning with the front façade of the stone and wood shingle house. It continues with river rock fireplaces in the formal living room, family room, and the master bedroom suite. The approach to the house is down a long driveway, some of which is lined in Belgium block. It does not conclude with the circle at the wide covered front entrance but continues to the attached three-car garage. The front door is framed by very wide sidelights and transoms. The spacious two-story foyer offers a hint about the generous size of each room, and about the level of detail in the design. Its hardwood floorboards are installed on a diagonal, a more expensive process that gives the eye something different to take in from the usual. There is also a darker wood border in the foyer, powder room, and the formal living and dining rooms. Above the entranceways into the living and dining rooms the moldings are wider than usual, lending themselves to decorating for the seasons and holidays, were one so inclined. In the dining room there is chair railing and wainscoting on the lower walls and a café-style door into the spacious gourmet eat-in kitchen. At the back of the foyer French doors open into the family room. Its floor-to-ceiling fireplace has a raised hearth topped in slate. Another set of French doors accesses the study or office with built-in bookshelves, which can also be entered from the living room. The study has a door to a private bluestone patio; a perfect little reading nook, according to one of the owners. On the opposite side the family room there is a wide entrance into the kitchen. The two rooms can be separated by pocket doors. Features in the kitchen include a large L-shaped center island topped in Calacatta Gold marble with a breakfast bar for four and a prep sink, and granite perimeter counters. High-end stainless appliances include a Sub-Zero refrigerator, Thermador double wall convection ovens and warming drawer, and a Wolf six-burner range top with grill. The built-in desk area is taller than usual to accommodate people’s habits. In most cases the home’s occupants are not going to sit for any length of time at this desk. Chances are they would just want to quickly look up a recipe or some other fact and are, therefore, more likely to stand. There is also a large walk-in pantry. The eat-in area has a door to the patio, pool, and yard. In the mudroom there is a long, comfortable built-in seat, the informal entrance, and access to the rear stairs as well as the garage. On the second floor there are five bedrooms, a large multi-purpose room for play or games, and a good-sized laundry room with a utility sink. The wide landing provides room to create another reading nook or homework station. The marble bath in the master suite features a decorative tile inlaid design in the floor, a soaking tub, double vanity, shower, and water closet. The master also has two walk-in closets. The spacious finished third floor offers plenty of multi-purpose space as a game, recreation or play room, home theater or exercise room. There is a full bath on that level. For more information or to make an appointment to see the house contact Pat Shea of Coldwell Banker Residential Brokerage at 203-895-0280 or Pat.shea@cbmoves.com.